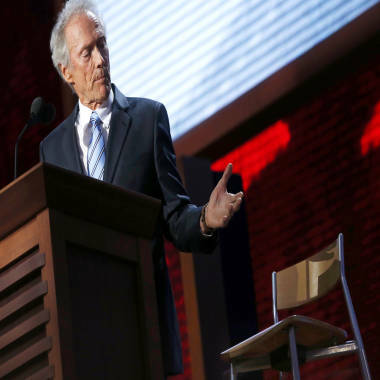 Clint Eastwood's discussion with an empty chair thrilled late-night talk-show hosts. Clint Eastwood is a Hollywood legend, but not all of his movies were smash hits. He’s no stranger to getting poor reviews. But he may never have received worse reviews than the ones he’s hearing from late-night talk-show hosts after his performance at the Republican National Convention on Thursday night, where he spent quality time on national television in spirited debate with a figment of his imagination. Much to the Romney campaign’s dismay (and to Sen. Marco Rubio, who might have otherwise earned headlines for his introduction of the nominee), Eastwood’s argument with an invisible man was the story of the day. “I don’t care how many Marco Rubios you put in between Clint Eastwood and Mitt Romney, Romney ain’t outshining this playlet I call The Old Man and the Seat,” Stewart said. And to the “Daily Show” host, it explained a lot. “We owe Clint Eastwood a debt of thanks, not only because it was a truly hilarious 12 minutes of improvised awesome in a week of scripted blah, but because it advanced our understanding,” Stewart said. “This president has issues, and there are very legitimate debates to be had about his policy and actions and successes and/or failures -– I mean, tune in next week –- but I could never wrap my head as to why the world and the president that Republicans describe bears so little resemblance to the world and experience that I experience. Steven Colbert went so far as to bring on a chair of his own to debate on the “Colbert Report.” This invisible foe was more convincing than the one Eastwood debated, as it had the house spouting Democratic slogans by the time the skit ended. So at least he showed the RNC that it could have been worse. Colbert also had to go back in time for something comparable, arguing “there has not been a political speech this powerful since the famous Lincoln-Bookshelf debates.” And he and guest James Carville differed on the impact the convention would have on the polls, with Carville predicting a 2-3 point increase. “The Romney people put Clint Eastwood out there,” Carville replied. Jay Leno was no kinder. “Wasn’t that bizarre? The only time I ever talked to an empty chair is when we had Paris Hilton on the show,” he said on his “Tonight Show” monologue. Leno also speculated, “Clint Eastwood said he got the idea earlier in the day when he saw John McCain talking to an empty chaise lounge at the hotel pool.” But McCain’s running mate looked better by comparison. “Be honest. After watching Clint Eastwood last night, Sarah Palin isn’t looking so bad, is she?” Leno said.